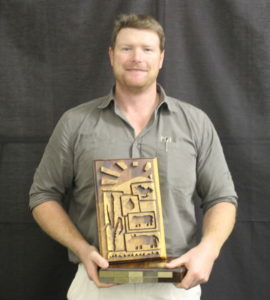 The KwaZulu-Natal Agricultural Union, Kwanalu, today (September 7, 2017) announced the winner of its KZN Young Farmer of the Year competition at its annual congress held in Pietermaritzburg. Beating off stiff competition, 38-year old golden kiwifruit farmer from Richmond, Ross Lowe, walked away with this year’s coveted provincial title and will now go on to represent KZN at the Toyota SA/Agri SA Young Farmer of the Year 2017 taking place in October. As a young farmer Lowe is blazing a trail in agriculture by farming golden kiwifruit – a relatively unknown commercial farming commodity in the South African market. As such Lowe has had to learn everything from scratch through extensive research, travel and by reaching out to farmers in New Zealand – the home of kiwifruit. On his win and on the future of farming in SA, Lowe said “The role of a young farmer in our economy is of huge importance in South Africa. We are the future of our country’s food security and safety and as the custodians of our land, we have to look after and cherish it for future generations. With no food, our economy will not flourish”. One of only 16 farmers of this variety of fruit in the whole of SA and one of only four in KZN, Lowe has had his work cut out for him since planting his first crop in 2014. Not only is planting, pollination and harvesting the golden kiwifruit extremely technical, it is also done mainly by hand which means he should be hands-on, 24/7. As for why Lowe chose the golden variety of the kiwifruit as opposed to its greener counterpart which South Africans are more familiar with, he believes they are sweeter, tastier and have huge potential in the local market as a result of their superior nutritional qualities. Additionally, there is 30-50% higher yield of fruit in comparison to the green variety so, commercially, it makes more sense, explains Lowe. Lowe has a total seven years farming experience, farming around half of that time on his current farm, Riverton in Richmond, where he lives with his wife, Carla and their children. Currently, 70% of Riverton Farm’s produce is the golden kiwifruit, with the remaining 30% split evenly between cabbages and potatoes, Lowe’s vision is to turn the farm into 100% kiwifruit farm that is fully commercial and supplying both the local market and growing export market. Lowe is also committed to sustainable farming practices and contributing to the country’s long-term stability through agriculture which is another reason he decided to farm the golden kiwifruit. “Land is such a precious commodity in our country and farming kiwifruit requires only a small piece of land to yield a relatively high return.” A high-value crop such as the golden kiwifruit also means the potential to increase wages for all staff on the farm. A firm believer in the role organised agriculture plays in supporting farmers and the agricultural industry as a whole, Lowe is involved in his local farmers association and helped establish the Southern Kiwi Growers Association about a year ago. Still in its early stages, the Association not only represents the best interests of kiwifruit farmers in KZN but also acts as a forum for its members to pool ideas, share knowledge and best-practices. “In Ross, we think we have a real winner – someone who is taking agriculture to the next level by exploring new opportunities – and we wish him the best of luck at the national competition!” said Sandy.